The Swedish AFO is an injection molded polyethylene splint providing static dorsiflexion assistance and lateral stability for the entire foot-ankle area. The injection molding allows for thicker polyethylene on the vertical aspect for rigidity and a thinner foot plate that may be trimmed with a pair of ordinary scissors. A heat gun may be used to further form splint if desired. The low arch and open heel give it a streamlined profile that fits easily into any shoe. Padding is provided on the calf section for extra comfort. A strap secures the AFO around the calf. Specify right or left, male or female style. Order by shoe size. TETRA foot orthotics are pre-formed styles available in full foot, three-quarter foot and heel lift. Sold in pairs except for the 9600-0. Full foot, 9500-0, is a 1/4” plastazote material which can be trimmed to fit. The Adjustable Heel Lifts, 9600-0, are a firm rubber material in layers to peel off and adjust to leg length discrepancies giving a 4, 6 or 8 mm lift. 3/4 length is available in 7 sizes and three densities. Low density is covered with a nylon cover (9900-B). 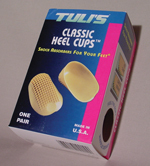 1409 Soft Line Heel Cups are 100% silicone in two densities which adapt to the anatomy of the foot. Size charts conversion to shoe sizes. Double ribbed waffle design provides protection and relief from the everyday pain of heel strike. Worn in your shoes. Helps to prevent sore heels and knees, shin splints and heel spurs. Available in regular for under 175 lbs. and large for over 175 lbs.